"Sticker Star" redirects here. For information about Kersti's home in the game, see List of implied locations § Sticker Star. Paper Mario: Sticker Star is an action-adventure, role-playing game for the Nintendo 3DS developed by Intelligent Systems. As the fourth installment in the Paper Mario series, it is the first Paper Mario title to be released for a handheld console. It is the successor to Paper Mario, Paper Mario: The Thousand-Year Door and Super Paper Mario, and is the predecessor of Paper Mario: Color Splash. It has been requested that this article be rewritten. Reason: it does not meet writing standards (tagged on September 28, 2014). The Sticker Comet breaks into six Royal Stickers, and five fall into the worlds surrounding Decalburg. The story starts during the night of the Sticker Fest, where the citizens of Decalburg come to witness the Sticker Comet which is said to make everyone's wishes come true. As Princess Peach, Mario and the Toads celebrate the event, Bowser and his troops suddenly crash the party to claim the Sticker Comet. The Toads try to prevent Bowser from touching it but fail, and the comet breaks into six Royal Stickers, one of which falls on Bowser’s head making him more powerful. Mario tries to attack him, but is overpowered and later wakes up with the Sticker Fest in a disaster: Toads have been stuck everywhere by Bowser, and the Princess missing. After regaining consciousness, Mario meets Kersti, a sticker fairy and the caretaker of the Royal Stickers. After a conversation with her, Mario then suggests that he will help her get the Royal Stickers back, and Kersti finally agrees with him and gives him an album. Mario starts by freeing the Toads affixed in tape placed by Bowser in the damaged festival, gaining a hammer in the process. After liberating the Toads, Mario heads towards the plaza east of town and discovers the area rolled up. The Toads push to unroll the Plaza and bring it back to normal, accidentally trapping a Green Toad under the fountain in the process. As Mario leaves the town, he gets ambushed by a trio of Goombas. Kersti uses the opportunity to explain how battling foes with stickers work and Mario defeats the Goombas. Mario exploring the first level of World 1. Mario starts his travels through the grasslands and across mountains. In the Warm Fuzzy Plains, Mario and Kersti meet a group of Toads hunting for stickers. They stumbled onto one Toad who dropped a rare Scissors sticker and quickly flees before warning them about Bowser Jr., who appears and demands that they give up the sticker. Mario defeats him using the Scissors sticker, and infuriated Bowser Jr. tears up the bridge using paperization and throws the bridge up onto a high ledge Mario cannot jump onto. Mario and Kersti get help from the group of Toads, who form stairs for them to walk onto the ledge, and Kersti teaches Mario the ability to paperize to fix the bridge. A similar incident occurs in Water's Edge Way, this time with Kamek who is chasing a Toad for his album page, and after losing to Mario uses paperization to toss away the Sticker Comet, which must be found to proceed. Depending on where Mario goes, he ends up in ether Hither Thither Hill, where Mario rescues a Green Toad, uses a Fan to get access to the windmill's door, hitting 4 number blocks inside to receive a warp pipe scrap, and eventually fighting a Big Buzzy Beetle along the way; or at Whammino Mountain where he goes up a Spiny infested mountain and causing a chain reaction in the level after hitting a fake tree, saving a Blue Toad and gaining a white gate scrap. After completing either level, Mario and Kersti arrive at Goomba Fortress, where the first Royal Sticker is being held. Mario travels through the fortress, dealing with its forces to reach the top where he and Kersti confront a Goomba corrupted by the Royal Sticker and his minions, who form into Megasparkle Goomba. Near the end of the battle, the Megasparkle Goomba splits and the other Goombas abandon their boss, claiming that the Royal Sticker is destroying who they are, and saying that they would prefer to be normal Goombas again. The enraged boss begins to battle alone, but Mario defeats him and obtains the first Royal Sticker. Mario and Kersti then head to a doorway which requires stickers to be placed on it to enter into the desert. They travel through a giant pyramid and through a Sphinx shaped like a Yoshi, where they retrieve a mysterious tablet piece from Kamek, who this time turns Mario's stickers into flip flops. After that, Mario and Kersti go through the Sandshifter Ruins and the Damp Oasis, which was destroyed by a sandstorm. After a Vacuum is used to remove the sandstorm and then a Faucet to fill the pond with water, Mario gains the second tablet piece, and then returns to Drybake Desert to obtain the third tablet piece. All of the tablet pieces reveal the Drybake Stadium, which was completely folded by Kamek thanks to his magic. After traveling up to the top floor, Mario faces Tower Power Pokey, the guardian of the second Royal Sticker, at the top. By defeating him, Mario and Kersti recover the second Royal Sticker. The next location is a forest. At the entrance is a sleeping Wiggler who must be awakened. He says that he was looking for food, due to the entire forest being polluted by poison. Mario and Kersti decide to help Wiggler and go to his house. However, deeper in the forest, Wiggler is snatched by Poison Bloopers, although both heroes think he just ran ahead. After going through The Bafflewood Mario and Kersti arrive at Wiggler's Tree House, they find that Wiggler has been broken into five segments by Kamek's magic, four of which have run away to different parts of the forest. Mario and Kersti must find the Wiggler Segments and bring them back to the Wiggler's head. Mario and Kersti go through the entire poison-infected forest trying to find each Wiggler Segment where various events happen, such as Mario losing his entire inventory (including his Hammer and Kersti) in Rustle Burrow (as well as fighting a Big Scuttlebug), and retrieving a Wiggler segment from a game show hosted by a Snifit that is housed inside a stump. After the Wiggler Segment is initially found and each level in World 3 cleared, it will run away to another level where it must be fought due to being enraged. On the Outlook Point the poison is discovered to come from an island near Whitecap Beach. Here, the last Wiggler Segment, after freeing it from Poison Bloopers, is enraged by this and runs to Surfshine Harbor to get a boat and reach the island. The Toad that owns the boat refuses, because a fishing boat was recently lost at the island. After this, the Wiggler Segment decides to finally return home. After Mario and Kersti reattach Wiggler, he decides to help them by taking them to the island where the poison comes from. There, it is shown that Gooper Blooper, corrupted by the third Royal Sticker, is the cause of the poison in the forest. After defeating the Blooper, the poison disappears, reverting the forest to its normal state, and Mario gets the Royal Sticker. Wiggler can again find himself food. The boat at Surfshine Harbor. To reach the other worlds, Mario and Kersti require the boat from Surfshine Harbor. The sailor Toad helps them with this after finding and placing back the boat's wheel and eventually using Scissors to remove some rope attaching the boat to the mast. However, before Mario, Kersti and the Sailor Toad can go anywhere, a Big Cheep Cheep suddenly attacks the ship. 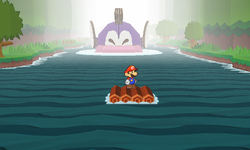 After Mario defeats it, the frightened Toad retires from sailing, enabling Mario to use the boat as he wishes. This world is snow-themed. As Mario and Kersti travel through it, they come across The Enigmansion, where its steward is sitting outside due to the mansion being haunted by "Terrifying Things", Boos, freed from the Book of Sealing. He tasks Mario to find all 100 of them, reseal them in the book, and place it on the pedestal in the basement. After the task is completed, Kamek then reveals himself, claiming that he released the Boos by accident when he was looking for a novel about stickers. He tears out all the pages of the book, and crumples them together to form the Big Boo, and leaves. When the Big Boo is defeated and sealed again in the book, the steward thanks Mario by inviting him to enjoy tea, as well as letting Mario have Forebear's Portrait, which is of the Enigmansion's previous steward. Mario and Kersti head to Whiteout Valley, where they use the portrait to fill the hole. The forebear thanks Mario by starting up the ski lift, which Mario rides to reach Bowser's Snow Fort. This place is a minecart coaster which Mario must ride to reach Bowser Snow Statue. After breaking it down, it's revealed to be Mizzter Blizzard, a snowman who only wanted a body that wouldn't melt, and although the Royal Sticker gave him that, it also corrupted his mind. When Mizzter Blizzard is defeated and the fourth Royal Sticker is obtained, his final words are to beg Mario to rebuild him next winter, so they can meet on more peaceful terms. If the player returns to the Enigmansion, the forebear has returned there, and the former steward is now a servant. Also, leaving the world causes Bowser Jr. to intercept and fight Mario. By defeating him again, Bowser Jr. retreats once more, returning to his father's castle. A Cheep Chomp chases Mario. At the next world, Mario and Kersti travel through a forested area where Spear Guys steal pieces of a bridge that requires crossing, ride a raft while avoiding dangerous obstacles, and get chased by a massive cardboard Cheep Chomp. This is followed by Chomp Ruins, where Mario has to battle a massive Chain Chomp, afterwards is the volcano itself, starting in Rugged Road where Mario uses a cold Thing to freeze one part of the Volcano. At Rumble Volcano, Petey Piranha, powered up by the fifth Royal Sticker, eats Kersti, so Mario must reach up to him and defeat Petey to free Kersti and retrieve the fifth Royal Sticker. Arriving at the Gate Cliff, the five Royal Stickers begin to react. As Mario places them on the wall, he can paperize the wall and flip it, revealing Bowser's castle which flies to the sky, out of Mario's reach. Upon hearing mention of a creature flying over the forest and by heading to Wiggler's house, they find out Wiggler has grown up into Flutter. Wanting to repay Mario and Kersti for restoring the forest, Wiggler flies the pair up to Bowser Jr.'s Flotilla. Here, Mario defeats Bowser Jr. for the final time, and is able to reach Bowser's Sky Castle. At the castle, Mario again faces and defeats Kamek for the last time. With him out of the way, Mario is able to continue on to Bowser at the final area of the castle, where Princess Peach is taped to a chain. During the final showdown, Bowser falls down into a pit with the last Royal Sticker, and emerges seconds later as a massive cardboard version of himself. With any attack dealing little damage to him, Kersti powers-up Mario to face him by sacrificing herself, apologizing for all the hassle she has caused him. With this power boost, Mario defeats Bowser, releasing him from the Royal Sticker's control. Mario frees Peach and uses the Royal Stickers to return everything to normal. After Peach congratulates Mario and the rest of the kingdom for their success, Bowser attempts to steal the Royal Stickers again, only for the revived Kersti to intervene. She jokes that she wants to change her career, and Mario, Peach, and Bowser laugh. Mario stomping on a Goomba. Note the HP bars aren't the same compared to those found in the final product. After forgoing the classic battle system in favor of a sidescrolling platformer-style system in Super Paper Mario, Paper Mario: Sticker Star returns to the turn-based system from the first two installments. However, players have to gather stickers, which are necessary both for solving puzzles and gaining battle commands. Stickers are a major part of the gameplay and storyline. Some real-world objects (called Things) appear in the form of stickers, and they also have the ability to be used to attack and overcome obstacles. Instead of leveling up from experience points as in the previous installments, Mario must find HP-Up Hearts, which each increase his current HP by 5 and increase attack power from First Strikes. Stickers replace Badges from the first two installments of the series. A new feature is the "Battle Spinner" slot machine which allows Mario to attack with multiple stickers in one turn, gain coins, or cause a different event to occur, depending on the combination received.. 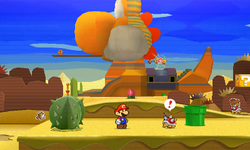 In addition, the gameplay places a lot more emphasis on the "paper" aspect than the previous games, containing status elements directly related to paper materials such as "soggy," "clipped," or "tacked;" additionally, the enemies sometimes transform themselves to better reflect the papery nature of their designs (e.g., a Goomba occasionally becoming a cone Goomba), transform as part of an attack (e.g., the Koopa Troopas), or simply resemble paper to begin with (e.g., the Big Boo fought in World 4-3). Many characters actively refer to themselves as existing within a paper world, most notably Kersti. The world's environments also resemble craft materials like cardboard. A few enemies that debuted in Super Mario Bros. 2 appear, such as Shy Guys, Snifits and Ninjis, the latter making their Paper Mario series debut here. When Mario battles an enemy, the screen will flash a certain color with the word saying "Fight" when the battle starts. It is a blue screen when Mario touches an enemy outside battle. If Mario hammers or jumps on an enemy, the words will say "Nice" with the blue screen along with a small fanfare jingle. However if Mario jumps on a spiky enemy such as a Spiny or a Piranha Plant or if Mario gets hit by the First Strike outside battle in this game, the screen will be red and orange as soon as Mario enters it. If Mario defeats all of the enemies on the first turn of the battle, then "Perfect Bonus" will appear on the screen, which earns Mario bonus coins. Spikes run to their position and ground pound. Stickers are the only items to appear in Paper Mario: Sticker Star. They serve as the only method of attack, items to solve puzzles, and the like. Stickers can be found anywhere in levels, being stuck across the environment and inside blocks, and can also be purchased in shops. Any stickers collected are stored in the album. There are many types of stickers, but the two main types are Jump stickers and Hammer stickers. Jump stickers include Jump, Hopslipper, Line Jump, and Iron Jump. Most Jump stickers can attack all enemies that are not spiked or have some other hazard on top of them. Hammer stickers include Hammer, Eekhammer, Slaphammer, and Hurlhammer. Most of them can hit all enemies except ones that wield wings, Spear Guys when holding their spear horizontally, or some other type of flying device, such as Kamek's broom. There are also stickers that support Mario in battle, such as Spike Helmets that give Mario a helmet that damages all enemies that attack him from above. Also in this category are Mushrooms that heal Mario and Leaf stickers that execute all action commands perfectly for one turn. Other types of attack stickers include Fire Flower and Ice Flower stickers that burn and freeze enemies, respectively. Certain enemies also occasionally drop stickers that represent their weapons - for example, Sombrero Guys occasionally drop Sombrero stickers, and Bob-ombs drop Bomb stickers. There are 2 special stickers that only appear in battle and then disappear when the battle is finished. Kamek turns all of Mario's stickers into Flip-flop stickers during the Kamek battles in World 2-2 and 6-3. Flip-flop stickers are similar to Eekhammers because they strike multiple times in a hammer-like fashion. Flip-flop stickers also retain their power status, i.e. a Shiny Jump sticker is a Shiny Flip-flop, a Megaflash Slaphammer is a Megaflash Flip-flop, etc. Flip-flops of the same size will appear the same, even if it is Shiny or Flashy. Once Flip-flops are used, they are gone from the sticker book, meaning that the player cannot get that sticker back once the battle is completed and their inventory is returned to normal. The second sticker of this kind is none other than Kersti, who will enter Mario's sticker book during the final stage of the Bowser battle. She will activate the Battle Spinner and will automatically give Mario a whopping five slots for stickers per turn. Even though Kersti will disappear from the sticker book once used, Mario wishes her to be alive again, so he can still Paperize and talk to Kersti after the battle. Although neither sticker can be tossed or sold in shops, selling Kersti is mentioned twice in the game: entering Decalburg's shop for the first time, and right before Kersti enters Mario's sticker book when battling Bowser. Also, if Mario is able to overpower Bowser without using the Kersti sticker, he is able to toss Kersti away. However, this action does not alter the storyline. Finally, there are Secret Door stickers that Mario is able to paste onto the environment via the Paperize ability. These doors reveal secret underground rooms containing rare stickers and/or Things that are usually not used for storyline purposes, such as a Thumbtack and a Squirt Gun. Every single sticker except Thing stickers sometimes have special traits applied to them, such as "Shiny", "Flashy", and "Big". These stickers usually sparkle in Mario's album and do more damage than usual to enemies. Stickers that have traits like "Big" and "Megaflash" take up more space in the album, not unlike Secret Door and certain Thing stickers. Typically, stickers wielding special traits are rarer than normal stickers. Battle Stickers and Thing Stickers come in three sizes: Small (4 Spaces), Medium (9 Spaces), and Large (16 Spaces). These allies temporarily join Mario's party and follow him around until they are taken to a certain location, where they perform an action or advance the storyline. In the Wiggler Segment's case, they must tire out before they join Mario and go back to Wiggler's Tree House. Unlike previous installments, the game has a level progression system. Each level course is unlocked after collecting a Comet Piece in the preceding area. The map is reminiscent of the one used in Super Mario RPG, though it is more open-ended and not linear. Many levels contain alternate exits that lead to other levels, and the goal of entering a level is not always to "finish" it by touching the Comet Stickers. (*) = Level with an alternate exit. (**) = Level with two alternate exits. All eight Super Flags in Decalburg. All eight Super Flags during the credits. There are a total of eight achievements that the player can earn in this game, all of which can be achieved at any time by completing the corresponding task. After completing Goomba Fortress and getting the first Royal Sticker, there are eight Super Flags in the Sticker Fest area of Decalburg. These can be examined to view the player's progress in unlocking the achievements. A completed achievement will display its corresponding flag, and any Super Flags will appear in the game's credits. Collect every single sticker type. Find and open all Secret doors. Spend 10,000 coins in Toad shops only. Get a Perfect Bonus (finish the battle in one turn while not taking any damage in battle) in 500 battles or more. Perform 1,000 "Excellent!" action commands in battle. Get three symbols matched on the Battle Spinner 50 times. When an accident scatters stickers across the land, Mario sets off on an adventure to repair a torn world. Searching Forests, Deserts and Mountains, Mario collects stickers to solve puzzles and battle monsters. In a first for the series, there are no experience points, so finding power-ups to improve Mario's abilities is more important than ever. 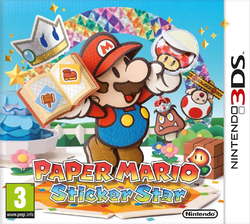 Mixing sticker-based gameplay elements with the traditional action-battle system of the Paper Mario series delivers a new twist on a classic franchise. Flatten-out characters, roll out towns, and walk through living, breathing dioramas in a brand-new Paper Mario adventure on the Nintendo 3DS system! Bowser once again becomes invincible with one of the game's key objects, much like the first game. The first chapter takes place in a grassland, and once again contains a boss that's fought in a castle/fortress-like setting. The second chapter takes place within a desert, as with the first game. The third chapter contains a darkened forest area, much like Forever Forest in Paper Mario. Additionally, The Bafflewood contains similar maze/puzzle elements. A giant Blooper is fought in this game, as with the previous three installments. The fourth chapter contains a multitude of Shy Guys, as with the first installment. The fifth world takes place within a tropical locale, just like Paper Mario and Paper Mario: The Thousand-Year Door. This world also has a cave or volcanic setting, much like the previous games. A plant-themed boss is fought in this world/chapter, as with the first game and Super Paper Mario. 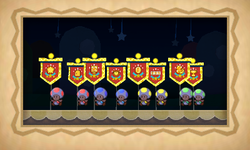 A parade takes place during the ending, just like the first Paper Mario. Therefore, the final boss can be fought again. A story epilogue occurs after each chapter is completed. Adding onto the above, all four installments contain rhyming dialogue in some way, shape, or form. The way Petey Piranha captures Kersti is similar to how Francis kidnaps Tippi in Super Paper Mario. This is the first Paper Mario title released for a handheld console. As it returned in Paper Mario: Color Splash, Paper Mario: Sticker Star is the first and so far only Paper Mario game to not start at the Mario Bros.' House, nor feature this place at all. Unlike the first two Paper Mario games, Paper Mario: Sticker Star does not have Flower Points, Star Points, Experience Points, Badges, or Items. Mario also has no partners to battle by his side (with the exception of Kersti at some points). This is the first game in the Paper Mario series where Lady Bow and Parakarry does not make an appearance in any form although Parakarry is mentioned on a paper in Shy Guy Jungle. Mario does not level up from battling as in previous Paper Mario games. All the bosses in Paper Mario: Sticker Star are not unique to the Paper Mario series, as they are all more powerful versions of preexisting enemies or bosses featured in other Mario games. Similarly, the game does not feature any new enemies, only enemies from other Mario games and new variants of them. Kamek takes on the role filled by Kammy Koopa in the first two Paper Mario games. This is the first Paper Mario game where Bowser and Luigi have no lines of dialogue. The world map is now used to get to other locations, unlike the other installments. Unlike Paper Mario: The Thousand-Year Door and Super Paper Mario, the game does not feature an Audience. While Mario does possess a hammer given to him by a Toad, he cannot use it in-battle without applying a hammer sticker, but only as a way to get a First Strike, unlike the first two installments. Mario also does not get the Super Hammer or the Ultra Hammer later in the game, due to the various Hammer stickers. This is the first Paper Mario game that is not split into separate chapters, instead opting to use worlds, like Super Mario RPG. If it were, there would only be 6 chapters, whereas the first three installments all possessed 8 chapters. Paper Mario: Sticker Star only has 55 enemies, 6 bosses and 12 mini-bosses, for a total of 73 different enemies; each of the first three installments had over 100 enemies. Unlike the first three installments, Paper Mario: Sticker Star has two counterparts to Jr. Troopa, Lord Crump, and O'Chunks, instead of one, since Bowser Jr. and Kamek are fought three times each (not including four Wiggler Segments who are each fought once). Unlike Paper Mario: The Thousand-Year Door and Super Paper Mario, Mario does not have any voice clips recorded by Charles Martinet in Paper Mario: Sticker Star. Paper Mario: Sticker Star does not have a superboss (a boss that can be fought after the final main boss, and generally has higher stats). This is the first Paper Mario game not to include enemy Tattles, recipes, and unique enemies and characters such as Clubbas, Merlon and Whacka. The lack of such characters is because Shigeru Miyamoto did not want to include characters exclusive to the Paper Mario series in the game, other than Kersti. On a related note, it is also the first game where enemy Koopas do not wear sunglasses. Due to the lack of a Tattle ability, several aspects of it have been incorporated into regular battle. For example, an HP bar showing the collective health of all enemies on screen displays during battle. The enemies' names are also all displayed while Mario is choosing stickers, similar to the Mario & Luigi series. This is the first in the series to have only one playable character. Moreover, it's the only one to not feature Peach as a playable character. Peach's role in this game is also significantly less vital than in the first three. 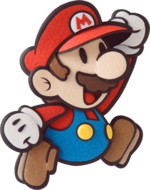 It is the first Paper Mario where Mario cannot turn into an 8-bit version of himself. Ninjis in Paper Mario: Sticker Star are now actual enemies. In their previous appearance in Paper Mario, they were friendly NPCs who acted as caretakers for the Star Kids. Other than Wiggler, Toads are the only friendly NPCs in Paper Mario: Sticker Star; there are no friendly Goombas, Koopas, Bob-ombs, or other enemies. However, a Koopa does volunteer for Mario to use for the shell attack stickers, as does a Bob-omb for the bomb attack sticker. Mario cannot choose which enemy to attack if there are multiple ones; he defaults to the one in front. Unlike the first 3 installments, Mario starts his journey with 20 HP, as opposed to 10. When Mario's current HP is at most 30% of its total, the in-battle music (except for the final battle with Bowser) changes to a "tired" remix of itself, replacing the alarm sound heard in the other Paper Mario games while being in critical health conditions. Unlike the first 3 installments, Paper Mario: Sticker Star only has 3 save files instead of 4. The game does not feature an opening story before the title screen as the other Paper Mario games; the opening story is instead shown when starting a new game. This is the first Paper Mario installment since the original N64 installment to lack a fully playable epilogue; though the game does save after being beaten, it is only to add a Toad on the Sticker Fest grounds that will replay the credits. This is the only installment to not feature the main antagonist on the box art. Due to this being a handheld game, this is the first installment in the Paper Mario series not to be playable on the Wii, as Paper Mario can be played on the Virtual Console, its sequel is playable due to Nintendo GameCube backwards compatibility, and Super Paper Mario is a Wii game. This is the first game in the Paper Mario series to have the maximum number of coins be 9,999 instead of 999. In a 2007 interview with Nintendo Power magazine, when asked about the future of the Paper Mario series, Super Paper Mario director Ryota Kawade stated that he was uncertain whether the next game would follow Super Paper Mario's gameplay style, return to the style of the previous games, or be based around a new concept. However, he also stated that the team "always feel that we want a challenge and to take on new things." Producer Kensuke Tanabe also stated, "I don't think we'll ever go back to the exact same game style as before," and that, "I also would like to look for another new and different style." Paper Mario: Sticker Star started development at the end of 2009. 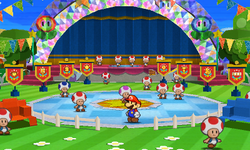 The development team thought Paper Mario was a good fit for the Nintendo 3DS and initially developed it as a RPG making use of the system's stereoscopic 3D display capabilities. After showcasing a build of the game at E3 2010, a demo of this build was previewed by Shigeru Miyamoto, who was reportedly unimpressed, dismissing it as "just a port of the GC version", and requested that the team "make a big change". Said development team was mostly composed of developers new to Paper Mario (planning and design staff being "about 90%" new, according to Kenji Nakajima"), with a few veterans brought in to help with the usage of old assets. Naohiko Aoyama, who conceived the original Paper Mario's visual direction but had little involvement with its sequels, was brought in as the director. Following Miyamoto's impression, the development team brainstormed ideas to make the game stand out. It was eventually decided to expand the Sticker mechanic, which had initially been designed for use in puzzles, and expand it to the rest of the game. As the sticker system expanded, the development team decided to abandon the partner system and traditional RPG elements such as an experience point system, with progression instead being outlined by the player getting progressively stronger stickers. Early in development, Miyamoto also encouraged the developers to keep the story to a minimum and only use pre-established Mario characters. The decision to not focus on the storyline was also influenced by results gathered from Super Paper Mario's Club Nintendo survey, which had less than 1% of the respondents citing its plotline as a strong point. Producer Kensuke Tanabe also asked the team to focus on the "paper" aspect of the visuals. Paper Mario: Sticker Star has received mixed reviews, gaining an average of 75.97% based on forty-nine reviews on GameRankings and 75 based on sixty-nine reviews on Metacritic. Compared to previous iterations of the Paper Mario series, its aggregate score is weaker, due to critics mainly complaining about what has been seen as frustrating game design and toned down story, gameplay, and characters. Cam Shea of IGN gave the game an 8.3, praising what he opined as a fresh take on the Paper Mario series with charming design and a sense of humor, but he criticized the sticker system, as well as some design elements he found frustrating. He wrote, "In spite of all my criticisms, [Paper Mario:] Sticker Star is still compelling to play and a great deal of fun. The game’s infectious spirit and sense of humour is irresistible, and it’s big, too – you’re not beating this one in a weekend. It’s just a shame that putting stickers at the heart of the game didn't turn out to be the master-stroke it so readily could have been. Paper Mario fans will enjoy [Paper Mario:] Sticker Star, but ultimately it’s just as notable for its failures as its successes." Edge Magazine UK gave the game an 8, praising Intelligent Systems's effort to shape its RPG for portable play. Destructoid gave the game an 8/10 and praised the game for what was opined as an impressive effort, but warned that the game may disappoint previous Paper Mario fans. Mike Wehner of The Escapist gave the game 4.5 stars out of 5, praising the game for its artistic style and its gameplay, while criticizing puzzles seen as frustrating. He wrote as the bottom line, "There's just no getting around it: Paper Mario: Sticker Star is yet another high-quality entry into Nintendo's cherished library of first party titles. The experience is high on satisfaction and low on frustration, making it an undeniably perfect fit for the company's mobile console. It's not entirely flawless, but as Mario games go, it's one of the best." JC Fletcher of Joystick gave the game 3.5 out of 5 stars. He praised an opined easygoing and funny nature of the game, but criticized the game design (seen as frustrating), saying that the existence of FAQs will improve the game, due to sacrificing turn-based battles with what has been opined as awkward platforming. Carolyn Petit of GameSpot gave the game a 7.5 out of 10. She believed the game to have smart and witty writing, good puzzles, and overall charm, but criticized the frustration of getting stuck and the combat system. She ended with, "[Paper Mario:] Sticker Star falls into a rut at times and may even drive you crazy, but in the end, Paper Mario's unwaveringly cheerful attitude, and fond memories of the game's many great moments, will be what stays with you." However, Andre Segers of GameXplain was more critical of the game, giving it a score of two stars out of five. He criticized the story as "one of the biggest and most unfortunate changes" and the puzzles, by saying that "the things you need [to solve them] could be found anywhere" and "the game provides no clues on where to find them". He also said that the battle system is "fresh and fun at first" but then started criticizing it, saying that there is "no sense of accomplishment after winning a battle", and ultimately referring to the combat as a "chore". However, Segers did praise the game for "trying some new things" and for its "flashes of typical Paper Mario brilliance". David Jenkins of Metro UK held a similar view on the game, giving it a score of 4 out of 10. He criticized the game's selection of characters, labeling Kersti as an "unlikeable nag", and contrasted the game's progression unfavorably with the immersion and character selection of previous Paper Mario games. Other points of criticism included an opined lack of meaningful rewards from battles and the amount of backtracking. While Jenkins praised the game's visuals and fine-tuning for a portable system, he ultimately labeled the game as "a horrible disappointment that not only fails to capture the magic of its predecessors but seems oblivious to what made them popular in the first place", recommending Mario & Luigi: Bowser's Inside Story in its place. Ray Carsillo of EGM gave a mixed review of the game, giving it a score of 6.5 out of 10. He asserted that the game "maintains all the charm and personality of those that came before it" and praised the aesthetics, 3D effects, and alternate routes. However, he criticized the battle system due to a perceived over-reliance on sticker collection, along with the amount of backtracking involved. The four Famitsu critics gave a very positive reception, giving it 36/40 points, calling it a "well-made RPG" and praised the sticker system as "unique". Nintendo 3DS Cam Shea, IGN 8.3/10 "In spite of all my criticisms, Sticker Star is still compelling to play and a great deal of fun. The game’s infectious spirit and sense of humour is irresistible, and it’s big, too – you’re not beating this one in a weekend. It’s just a shame that putting stickers at the heart of the game didn’t turn out to be the master-stroke it so readily could have been. Paper Mario fans will enjoy Sticker Star, but ultimately it’s just as notable for its failures as its successes." Nintendo 3DS Rich Stanton, Eurogamer 7/10 "Sticker Star has two sides. One is a world that's a simple, vibrant joy to be in. The other is a set of systems so pared back that they waver between easy and tedious, matched up to a badly signposted set of puzzles. There's just enough adventure and charm to mitigate the latter, but that's the shame of it; Sticker Star squeaks a pass when it could, and should, be spectacular." Nintendo 3DS Carolyn Petit, GameSpot 7.5/10 "Thankfully, making your way through stages is otherwise enjoyable. This isn't a platformer, but there's enough leaping on swinging platforms and avoiding deadly hazards to give Sticker Star's gameplay a pleasant Mario feel. Nods to memorable stages from early Mario games pop up from time to time, and the quest keeps you on your toes by throwing you into a number of unexpected situations. Mario finds himself in one fix after another, and before all is said and done, you'll have completed all sorts of death-defying feats, like riding a raft down a treacherous river, busting some ghosts, and even competing on a game show. Sticker Star falls into a rut at times and may even drive you crazy, but in the end, Paper Mario's unwaveringly cheerful attitude, and fond memories of the game's many great moments, will be what stays with you." As of March 31, 2014, Paper Mario: Sticker Star has sold about 2.21 million copies worldwide. Super Mario Bros.: Part of the overworld theme can be heard in the Warm Fuzzy Plains theme (along with a remix of said theme that plays when Gooper Blooper is poisoned during his fight), as well as in the game's credits. Also, a baseball-styled rendition of the "Course Clear" theme from this game can be heard when Mario uses a battering Thing sticker. Super Mario Bros. 2: Pokeys based on their appearance in this game appear. The main theme is a jazzy version of the credits theme with snippets of the main overworld theme. Super Mario Bros. 3: The Goomba's Shoe, Super Leaf, and Frog Suit return directly from this game, now as stickers. An Airship also appears. The athletic overworld theme is remixed for the ski lift ride in 4-5. Also, the King's theme is remixed for the afterward to a Royal Sticker boss battle in Paper Mario: Sticker Star. When the Snifit host explains the rules to Snifit or Whiffit, a remix of the Spade Panel plays. Super Mario World: Portions of the music inside the Enigmansion, along with the music played when talking to the owner while he waits outside, are remixed from the Ghost House theme. In addition, Bowser Jr.'s final moments in the game mirrors the post-level screen for Ludwig's castle. Super Mario World 2: Yoshi's Island: During the very final battle phase with Bowser, a portion of the music that plays is based on the Superstar Mario theme from this game. Super Mario RPG: Legend of the Seven Stars: The beginning of Paper Mario: Sticker Star has a cosmic object being shattered into pieces, and the main character has to retrieve the pieces of the object, similar to this game. In addition, the main bad guys are implied to have left at least one of the pieces to be guarded by a monster, similar to Smithy's Gang. When walking down the hallway in Bowser's Sky Castle, the camera is in an angled position that is similar to the camera position in this game. Lastly, during the final battle, Bowser uses a Chain Chomp as a weapon, much like he did in Super Mario RPG. Also, the parade in the end credits is similar to the one from this game. Super Mario Land 2: 6 Golden Coins: The music played when using the Boom-Box is a snippet of the Space Zone theme from this game. Super Mario 64: During the mine cart ride in World 4-6, a remix of The Princess's Secret Slide plays. Paper Mario: Similar to the first Paper Mario, Bowser ends up becoming nigh-invincible from a magical wish-granting object. In this case, however, it was purely by accident. Also, in both games' climax, Mario confronts Bowser at a flying castle, and Bowser also ends up growing larger in a last ditch effort to beat Mario after his initial invincibility was temporarily disabled, also significantly bolstering his invincibility to be absolute. The game ends with a parade, much like this game. Enemies like Spear Guys and Ninjis make their re-appearance in the series since this game. Also, a letter written by Parakarry may be found in Shy Guy Jungle in the garbage before Mario uses the vacuum item. Mario's design and expressions are more based off him in this game, as well as the scenery. If the worlds in Paper Mario: Sticker Star are completed in numerical order, the boss of the fifth "chapter", as in Paper Mario, is a Piranha Plant fought inside a volcano. Additionally, a slight remix of the Dry Dry Ruins theme (combined with the Super Mario Bros. underworld song) can be heard in the cavern of World 2-1. Mario Kart: Super Circuit: The Yoshi Sphinx in this game is similar to the one found in the background of Yoshi Desert. Super Mario Sunshine: Bowser Jr., Gooper Blooper and Petey Piranha, which made their first and main appearances in this game, return. Also, one of the questions Snifit or Whiffit afirm that Princess Peach is Bowser Jr.'s mother, possibly referencing the story of Super Mario Sunshine. Paper Mario: The Thousand-Year Door: Searching the dump in Shy Guy Jungle before using the Goat or the Vacuum reveals a memo from Goombella, who is apparently still attending University of Goom and doing research on the Chomp Ruins during the events of the game, but is never seen. The miniboss theme is a remix of this game's. Mario's expression when first seeing a Boo is the same as Doopliss' when his name is guessed. 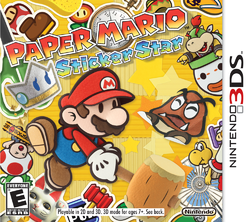 Also, the outline of this game's logo is used in the "Paper Mario" part of the Sticker Star logo. 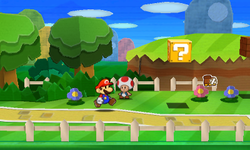 Super Paper Mario: At the beginning of the game, after Mario saves one of the Toads in Decalburg, the latter will say that Bowser crumpled him up 256 times, which is a nod to the running joke in Super Paper Mario, starting with Dimentio claiming that Dimension D makes his attacks "256 times more powerful", followed by Flint Cragley's camera crew stating that the "Rainbowzilla" story was apparently told that amount of times. This number is also the number of cards in the game. Super Mario Galaxy: Portions of the music inside the Enigmansion are remixed from the Ghostly Galaxy theme. The way of getting a Royal Sticker resembles to the one when getting a Power Star. New Super Mario Bros. Wii: Some of the enemies, such as Ice Bros. and Scaredy Rats that appeared in this game return in this game. Most of the enemies and the areas are also designed from their appearances from this game. The Big Buzzy Beetle is an unused enemy in New Super Mario Bros. Wii. Super Mario 3D Land: The Poison Mushroom has the same design as in this game. Also, one part of the title screen music sounds like the beginning of Special 2-1's music from this game. Some of the designs, such as the trees in World 7, are reused in this game. New Super Mario Bros. U: The Big Buzzy Beetle who debuts in Paper Mario: Sticker Star reappears as a species in New Super Mario Bros. U, although it was an unused enemy in New Super Mario Bros. Wii. Also, Bony Beetle has the same design as in this game and Bowser Jr. uses the same glass dome in his Junior Clown Car. Mario & Luigi: Dream Team: The Snifit or Whiffit quiz show has the same ✔ and ✘ blocks as to the ✔ and ✘ panels in the Check-X Quiz in this game. 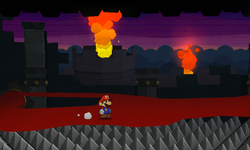 Super Smash Bros. for Nintendo 3DS: Hither Thither Hill and Bowser's Sky Castle appear as a variations of the Paper Mario stage in this game. The Fan Thing also appears in the background of the stage variation. Mario & Luigi: Paper Jam: Many of the bosses and enemies return in this game. Paper Mario: Color Splash: Many of this game's elements return, such as the different types of Stickers originated there (Hopslipper, Line Jump, Iron Jump, Eekhammer, Hurlhammer, Tail, Frog Suit, Spike Helmet, etc. ), Thing objects, Birdo singing in a performance, and Snifit or Whiffit. For this subject's image gallery, see Gallery:Paper Mario: Sticker Star. In Yoshi Sphinx, if the player hits a Koopa Paratroopa and a wall at the same time after the fight with the Koopa Paratroopa with wall will push Mario through the floor and give the player a game over. Originally, Bowser's Sky Castle was meant to have minigames, but due to development time restraints they were cut. Pre-release screenshots also showed a Chain Chomp partner as well as a Monty Mole boss, though both were removed from the final game. The game was directed by Naohiko Aoyama and produced by Kensuke Tanabe and Toshiyuki Nakamura, with Satoru Iwata serving as the executive producer. Paper Mario: Sticker Star - The game's theme, as heard in the E3 2011 trailer and the title screen theme. Whenever a major new character is introduced, the game pauses to show the player their name, similar to Super Smash Bros. Brawl. From its release for download onto the Nintendo eShop until January 6, 2013, Club Nintendo members in North America who downloaded Paper Mario: Sticker Star and registered it on Club Nintendo also received Donkey Kong: Original Edition for free. The e-manual says Mario can die by falling, though this is impossible without glitches. Similarly, Kersti says that if players touch the spikes in the rolling carpet section of Bowser's Sky Castle then he will be "done for", although they only send Mario back to the beginning of the area if he falls off the rolling carpet and take away 1 HP. It may just be a figure of speech. All the bosses except for Bowser say "Shiny" at least once. Bowser does not speak, apart from a loud defiant roar, which is heard off-screen. This particular roar was taken directly from New Super Mario Bros.. Bowser can also be heard laughing sinisterly when he suddenly ambushes Mario and Kersti, before suddenly roaring in defiance once again. No matter how many enemies are beaten, the maximum coin bonus Mario can get at the end of a level is 300. ↑ 2.0 2.1 Williams, Drew (May 2007). "Super Paper Mario: The Interview". Nintendo Power Issue 215: p 76–78. ↑ IR Information : Sales Data - Top Selling Software Units - Nintendo 3DS Software. Nintendo (March 31, 2014). Retrieved November 15, 2014. This page was last edited on April 5, 2019, at 20:34.